Awesome! I'm so thrilled with the interest in the ornaments! Thank you! And thanks for cooperating in the head-count — sooooo helpful, and quite eye-opening. I'm so very glad I asked! I have completely changed my estimates on this, and I will be putting the kits on sale on Wednesday at 9 a.m. PST — I'll post the detailed information here on the blog, and give you a link to my web shop where you can purchase the kits. The price will be $25 per kit — each kit includes the written instructions and photos, the pattern templates, an embroidery tutorial, and all of the felt/floss/rick-rack/yarn you will need to create all three ornaments. I truly think there will be plenty of kits for everyone, but please do try to order early — there's a time-factor here, since, as I said, I will need time to put them together, and I really want you to have enough time to work on them. PLEASE NOTE that the kits will not ship until sometime in October, depending on how quickly the supplies come in and how quickly I can get the orders put together and processed. This will be the biggest quantity of orders I've ever processed at one time, and I would be so very grateful if you could check your shipping information on Paypal now and make sure it is updated and accurate. When the quantities get this big, it gets really difficult for me to keep track of emailed changes to shipping information after the order has been placed. I prepare my shipping labels in batches through Paypal itself, so it all goes exponentially more smoothly when the information is correct. 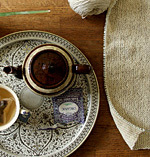 Please see my FAQ page for more information on how my web shop works, and how to order from it. Thank you! This is going to be so much fun! I worked on the pattern all weekend with my sister and it all looks so pretty. I love it. I'm very excited. The downloadable PDF of the pattern will be available in a few weeks, and don't forget that if you are purchasing a kit you do not need to download the PDF — a printed copy is included in your kit. Okay, I think we get it, right?! Now. BANANA BREAD. I love you, banana bread. You are good for breakfast, lunch, or dessert. (I would say dinner, but that slot I reserve for banana milkshake.) You are always moist. You always come out of the pan. You are always welcomed as a gift. You are made out of rotten fruit (a staple of our kitchen). Even if someone forgets to put you in a Ziploc bag and leaves you on the counter alone all night it does not even matter. You do not hold grudges. You are happy to be here. You never, ever fail me. There is nothing I don't like about you, banana bread. You are my roll model. Preheat the oven to 325 degrees F. Put the flour, baking powder, baking soda, and salt in a medium-sized bowl and combine well. In a stand mixer (or you could just mix it by hand, I'm sure), mix the melted butter and sugar and beat until blended. Beat in the eggs one at a time, then the mashed bananas and vanilla extract. With a wooden spoon, stir in the flour mixture — I just add it all at once, to be honest. Stir just until mixed. Pour into 2 greased and floured 9" x 5" loaf pans and bake for 50 minutes to 1 hour. A toothpick should come out "cleanish," as Nigella says. *Sorry about the baking powder error! I am insane. 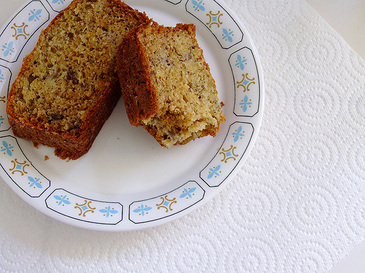 i LOVE banana bread...probably my favorite...also grew up eating mom's zuchini bread. now off to buy rotten bananas! ooo I love banana bread! I'm so craving it now!! I love banana bread too, so I am going to try your recipe. 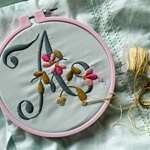 Can't wait to order one of your new ornament kits! I love banana bread, too, and have missed it since we've started shopping for produce at the farmer's market...no bananas there. Maybe at Christmas we'll treat ourselves to some bananas for banana bread...with chocolate chips, of course! I love that plate your 'nanna bread is on, too. There are no nuts in this bread? Is that even legal?? Must try very soon. Also, do you eat your banana bread with cream cheese on it? 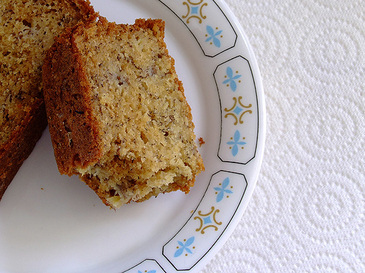 That's the way my aunt always gave it to us when she would take us on hikes when I was little, and it is now an absolute MUST if I have banana bread in the house. I guess I'll be heading to the market for bananas now! Ha! roll model! not sure if that was on purpose but either way, so funny!!! Guess what I'll be baking this week. Looks scrummy. I love that this recipe has no nuts! I will use it for sure, and I won't feel bad that I did not add the nuts since it calls for none! Nuts in baked good is not one of my favorite things. This really has 1/4 cup of baking powder? Do you have any idea how much I love YOUR recipes? And I can't find a good BB recipe - now, I can't wait for my bananas to go bad. Thanks sweets! Yummy! Banana bread! How funny you should talk about it. My husband and I are heading over to eastern WA later this week to stay in his parents vacation house, something we do every fall. I always make a couple of loaves of banana bread to take with us. I love having something homemade for breakfast while away from home. OOOOPS! Well, I used 1/4 c. Because I am a lunatic. But really the recipe calls for 1 T. + 1 t. (I doubled Nigella's to make 2 loaves.) Thanks for the catch guys -- though I can't vouch for the corrected version since I did dump a 1/4 c. into mine. And lived to tell the tale. Though 1/4 c. of baking powder seems like it would be dangerous. . . . SORRY about that! I have a pumpkin bread recipe that I swear by, to the point of making all other breads based on it - just replace the pumpkin with any pureed fruit. But this recipe *might* just make me cheat on my pumpkin recipe. Looks delicious. And I like that it has no oil. Yum! Banana bread recipe sounds great! And I am soooo excited about the ornaments!! Yippee! The price seems perfect for the kit. I think it will make a lovely school auction donation. One of my favorite things to do for breakfast with banana bread is to make french toast --- you should try it, it's yummy. Also, when camping, we fry it in the frying pan so it gets warm and crispy on the outside. Dee-lish. I love this quote from Nigella about banana bread "...it fills the kitchen with an aromatic fug which is the natural atmospheric setting for the domestic goddess" Actually, I just love Nigella. If you doubled the recipe, 1/4 cup isn't THAT much baking powder. 1/4 cup = 4 tablespoons. 2 teaspoons is 2/3 a tablespoon therefore, 1 tablespoon + 1 teaspoon doubled is nearly 2 and 2/3 tablespoons and well, never mind. It looks really good is all.